The centrosome, a small organelle, is a key microtubule organising centre in cells. It is composed of a pair of cylindrical centrioles that are embedded in a protein-rich matrix. In each cell cycle the centrosome duplicates once and only once in a semi-conservative fashion much like the DNA in the nucleus. 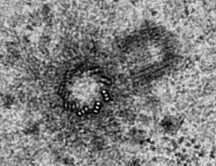 Centrosomes play important roles both in cycling and non-cycling cells: in the former they participate in building the bipolar mitotic spindle, whereas in the latter they modulate the assembly of the primary cilium, a structure implicated in sensing and signalling. The presence of functional centrosomes is therefore important for cell physiology. The last few years have seen an impressive increase in our knowledge and understanding of the biology of the centrosome, but many unanswered questions remain. Indeed, how does the cell actually build a centrosome? What are the regulatory pathways that ensure timely assembly of the new centrosome? Does the centrosome have different roles in symmetrically and asymmetrically dividing cells? Does the centrosome have specialised functions in different tissues? By inviting speakers with a wide range of expertise we aim to provide a multi-disciplinary forum that will facilitate exchange of ideas. 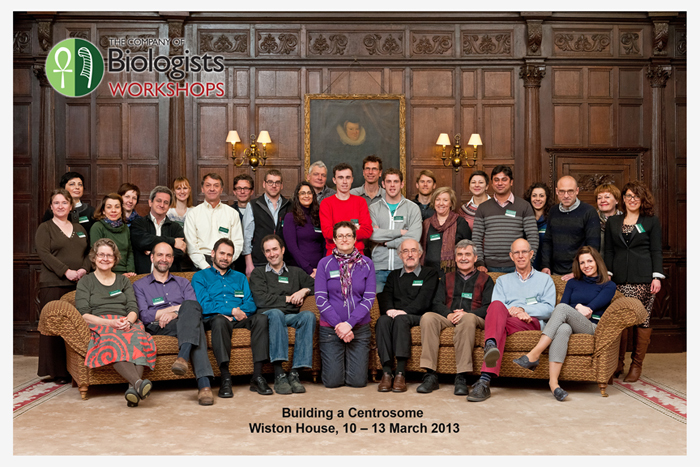 We are confident that this exciting workshop will give fresh impetus to tackling outstanding questions related to centrosome biology. 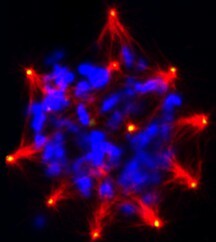 Abnormal mitosis in a cancer cell containing supernumerary centrosomes. 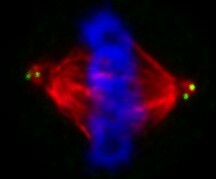 Microtubules are red, centrosomes are green and DNA is blue. Scale bar is 10micrometer. Electron micrograph of a centrosome. Scale bar is 500nm (image is courtesy of Joo-Hee Sir). Normal mitosis in a lymphocyte. Microtubules are red, centriole pairs are green and DNA is blue. Scale bar is 5 micrometer. 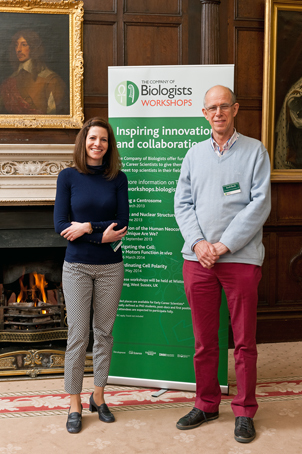 Meeting report written by Alexandre D. Baffet, Carol-Anne Martin, Ilaria Scarfone, Owen M. Daly, Ahuvit David, Alexandra Tibelius, Ramona Lattao, Muhammad S. Hussain and Jeffrey B. Woodruff and published in the Journal of Cell Science. JCS Executive Editor Sharon Ahmad’s interview with Jordan Raff at the Workshop.